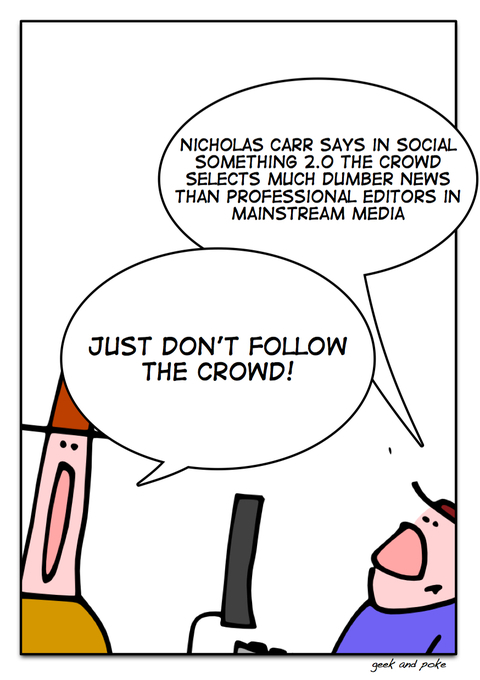 Nicholas Carr writes about the crowd selecting dumber news in Digg et al than the smart editors in mainstream media. Nicholas, you don't have to read Diggs home page! There is more in citizen journalism than the top diggs, reddits etc. You also can read something no one has suggested. You can read things almost no one knows of. That's the big difference to mainstream media. Of course, 2.0 has not made us smarter. It just has given us more choice. TechCrunch also posts about the survey Nicholas Carr's post is based on.